I am an unbiased professional (wink), meaning I can’t tell you how unhappy I am that Walmart acquired ModCloth back in March. Therefore, I won’t tell you. You’ll have to come to your own conclusions. One might guess that the earth shook under ModCloth’s founder from the sheer volume of negative DMs falling into her various inboxes. Unfortunately, Koger didn’t handle all the negative attention well. She replied angrily and defensively to disgruntled fans (as seen in a post to Koger’s public Instagram profile). Say you receive an extremely negative review (been there). 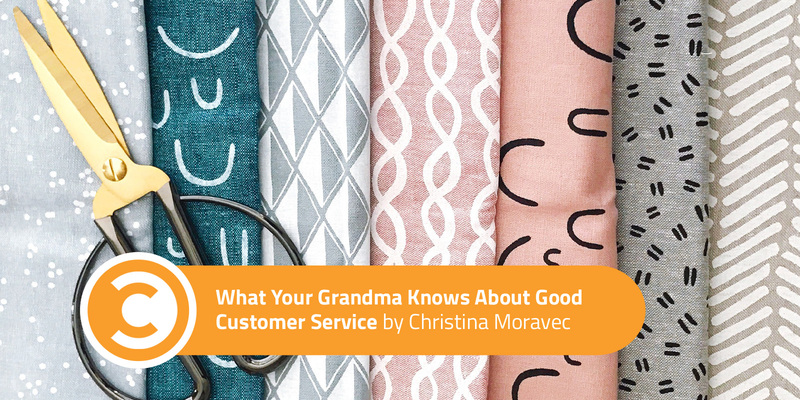 Yes, customers expect a response in less than an hour. However, if your response carries a whiff of bitterness, take a deep breath and step away from your technology. In fact, take a walk. Take all the time you need to respond with heart. In these hateful cases, brands or public figures (or, frankly, any other sentient being) should dig deep to respond as graciously as possible. If someone hurts your feelings or insults your character, never respond in hate or anger. Instead, confide. Thank you, [name], for reaching out to me. I hear you. Thank you for speaking of your disappointment, for in truth, you are not alone. I am undeniably grateful for your loyalty to ModCloth over the years. While I have made no money in this sale, I am grateful that, through this necessary acquisition, our staff can remain employed and ModCloth, my brainchild, can remain in the world. Moving forward, we will stay diligent in upholding our values and integrity. In my perfect world, you will join me on this journey. 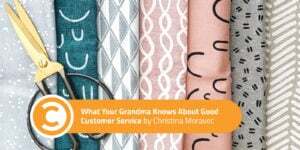 I will rely on you and others to keep us on our toes in staying true to our brand, customers, and employees. Thank you, again, [name]. I am feeling your disappointment as well, but have hope that the future of ModCloth will be bright. Additionally, if I were Koger, I would not belittle my customers by posting their legitimate concerns on my public social media accounts. Even though Koger was justified in feeling hurt (I would feel hurt, too), I believe she has the responsibility to act in kindness. ModCloth now sounds like every teenager who’s ever tried to convince their mother they don’t smoke pot, even though their friends are the notorious neighborhood stoners. In joining forces with Walmart, ModCloth should have expected significant backlash. Walmart, after all, has faced a battery of negative press surrounding the treatment of employees, among other criticisms. 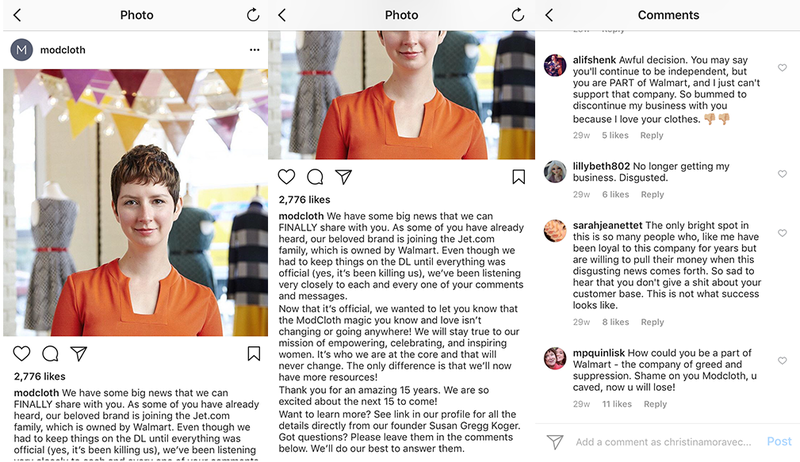 I am surprised that ModCloth hadn’t prepared excessive resources to communicate, again and again, who they have been as a brand, who they will continue to be, and the promises they mean to keep, to customers and employees. 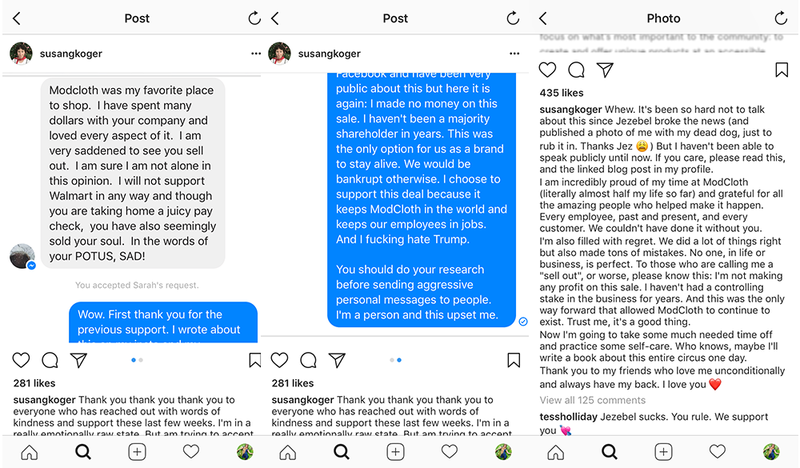 To give ModCloth co-founder Susan Koger some credit, a few priceless nuggets of realness can be found on her blog about the acquisition. However, the blog still comes off as a spoonful of sugar to help the medicine go down. The hostility from fans worldwide could only have been soothed by continuous, generous communication, along with an assertion that ModCloth is not the company they keep (Walmart)—undoubtedly an impossible feat, as this would entail biting the hand that feeds them. ModCloth will continue to fight an uphill battle. My only wish is that they begin to face the concerns of their fans head on, as magnanimously as possible. Do you think we should send them a copy of Hug Your Haters?